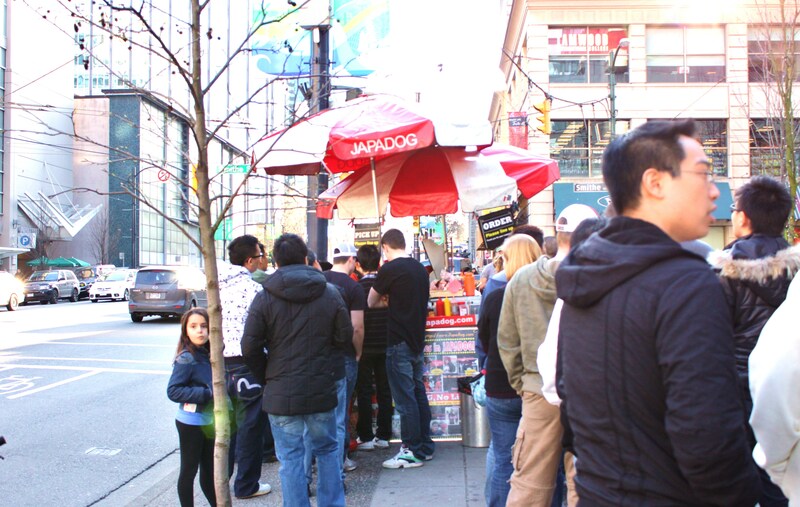 The Japadog stand is somewhat of a Vancouver institution. What started out as a creative twist to regular street vendor hot dogs has become so popular in recent years, they’ve actually been able to set up a second location, and are opening a store on Robson street by the Central Library (who’d ever heard of a chain hotdog stand?!). And it just keeps getting more popular – what recession? 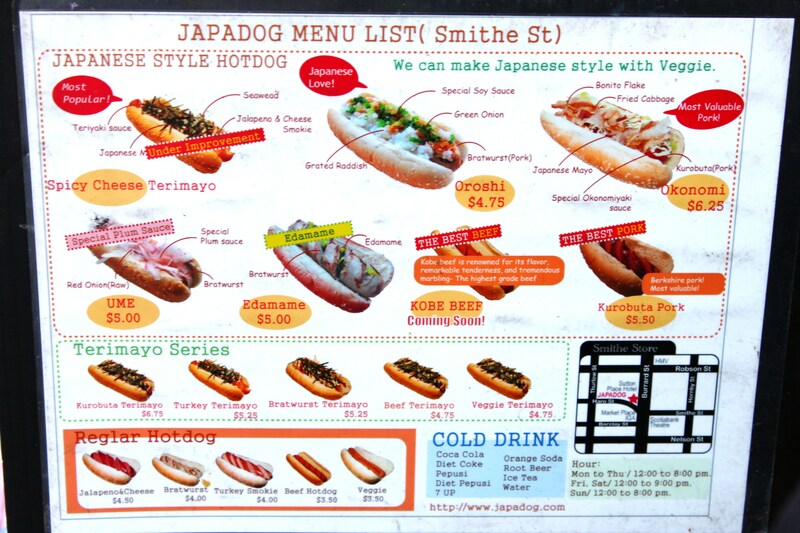 Japadogs are essentially normal hot dogs – the kind you would buy from any stand on Robson St./Burrard St./etc. – with Japanese toppings. 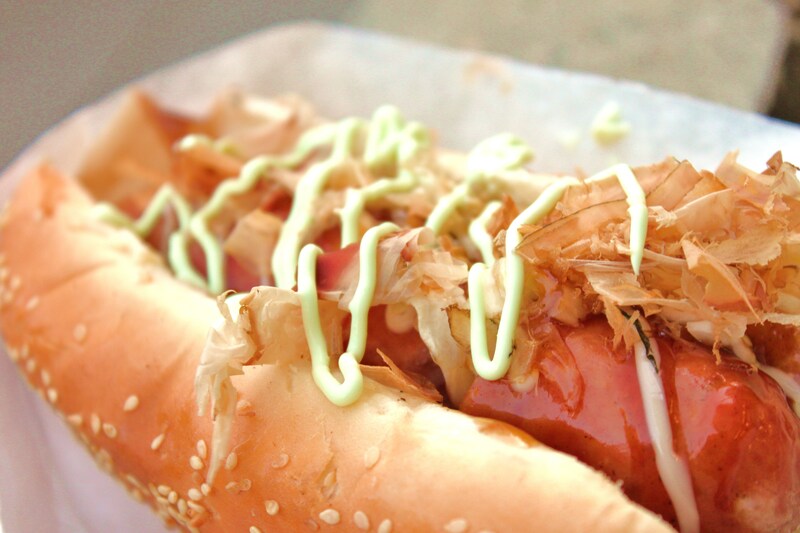 In 2005, Noriki Tamura, the owner of Japadog, wanted to open a street food stand. However, due to archaic Vancouver by-laws, only pre-cooked, ready-to-eat foods are allowed to be sold, which basically means no crêpes, no curry fish balls…heck, I’m not even too sure fries are ok. Probably not. So basically…you can sell hot dogs. But there are so many hot dog stands in Vancouver already (since no one can sell anything else! ); how do you attract customers to yours? The answer – make unique toppings that would appeal to locals and tourists alike. Throw in a few colourful signs and cute Japanese service (read: lots of quick bowing and ‘お好みです！プリズインジョイー！/Okonomi desu! Pureesu enjoy!’ – they’re so polite! ♥♥♥) and voilà! 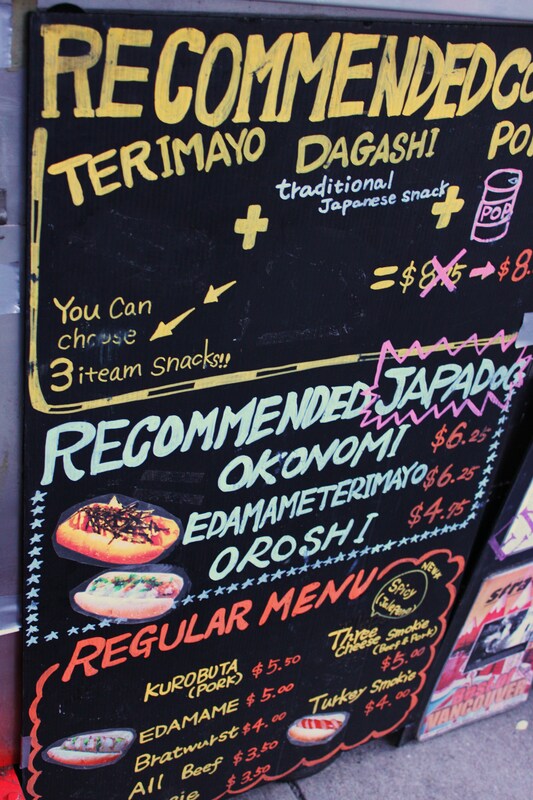 – Japadog was born. …only to order and go and stand in the pick-up line (cruel, eh?). But from here, you can see how they make the toppings! First-timers normally get the Terimayo – a beef sausage dressed in Japanese mayonnaise and teriyaki sauce with shredded nori (dried seaweed). However, since I’m not the biggest fan of teriyaki sauce, I prefer the Okonomi – pork sausage with fried cabbage, okonomiyaki sauce (just a bit) and Japanese mayo, topped with bonito flakes. There’s also the Oroshi – a generous scoop of grated radish on top of a pork sausage with green onions and soy sauce – and the Ume – raw red onions on a pork sausage with ume (plum) sauce. There’s even an Edamame version – Edamame beans packed inside a sliced pork sausage – but I have yet to try it. Here’s another thing I discovered here – wasabi (deu. : Meerrettich) mayonnaise is fantastic. Its pleasant light green colour, coupled with its subtle kick of hotness, almost ensures that I will never again be satisfied with regular Japanese mayo. I have to admit, Japadog is not exactly the cheapest hot dog you’ll ever have, or perhaps even the tastiest. It is, however, an interesting experience definitely worth checking out! omgggg you just made me salivate!! 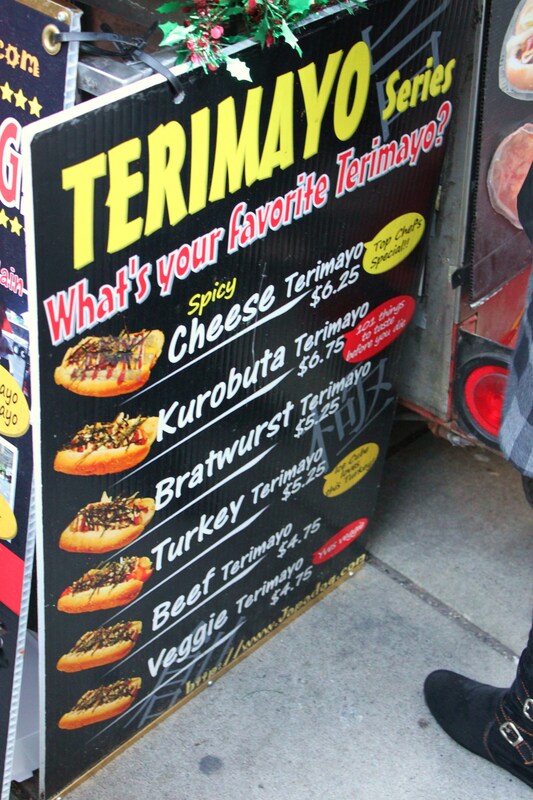 The newer Japadog is right outside my office building but I don’t go very often b/c I know it’s bad for me haha 😀 But I still ❤ terimayo and also the one with kurobata pork… not sure why but it does taste better than regular hot dog meat! it does taste better than normal hot dogs! it’s the sausage – big, juicy bratwurst instead of a skinny american hot dog (also the pork-ness as opposed to beef…). is the lineup at the new japadog just as long?